Successfully Added Mini LCD Projector - 100Lumens, 800:1, HD Resolution, 30W LED Bulbs, HDMI, VGA, AV, Micro SD Card to your Shopping Cart. 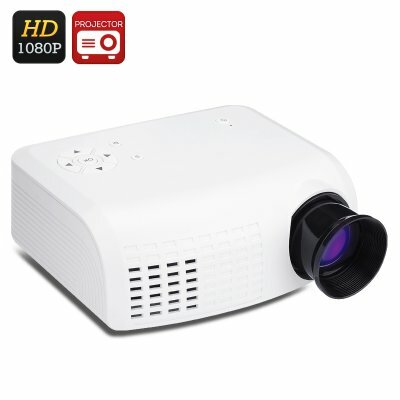 Watch a movie, tell a story, go through fun vacation photos or make a video presentation with the mini LCD projector. 100 Lumens and HD resolution will ensure high image quality and lots of light. If you don’t feel like filling up space with a bulky projector – a mini version is a great option. It will save you space, trouble and will be super easy to take around. Coming with all the functionality of a larger device, the mini LCD projector has a lot of great applications. Organize a fun movie night with all family and friends – project your favourite films and videos onto any surface or show your photos and videos on a large HD screen. The mini projector is also a great productivity tool for the office. You will be able to instantly show your demos and presentations in great quality and always keep the gadget handy thanks to its small size. The projector features 100 Lumens, comes with 30W LED bulb with a lifespan of 20,000 hours and will always give a bright picture. This projector also sports great connectivity and comes with a USB, HDMI, VGA and AV ports – as well as a micro SD card slot that means you can hook it up to your PC, TV box or games consol for a fully integrated home media system and the whole family will enjoy the fun. The Mini LCD Projector comes with a 12 months warranty, brought to you by the leader in electronic devices as well as wholesale LCD projectors..